Jokke Sommer and friends adventure into Spain to jump off buildings in Benidorm. Jokke Sommer is a professional skydiver and BASE jumper. He has always been fascinated by everything that could fly and dreamed one day to fly himself. When he matured his childhood dream faded and he started a career in Motocross. This sport became his biggest passion and an important part of his youth. After several years of riding, he started to Freestyle and built his own FMX park where he and his friends met to ride and fly. Benidorm is a city in the province of Alicante in eastern Spain, on the Mediterranean coast. Until the 1960s, Benidorm was a small fishing village; today it is known for its hotel industry, beaches and skyscrapers. According to the 2014 census, Benidorm has a permanent population of 69,010 inhabitants, making it the fifth most populous town in the Alicante province. Benidorm has the most high-rise buildings per capita in the world. A group of guys from all over the world ended up on a epic trip across Norway, France and Italy to jump a heap of objects sadly since this year we have lost most of them to different sports and accidents. 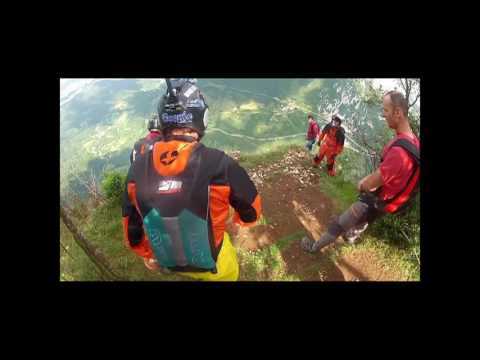 Take a look back in time with Shane McConkey as he BASE jumps from a cliff in Lauterbrunnen. This segment and many more are featured in the film “McConkey”, now available on Red Bull TV! Shane McConkey (December 30, 1969 – March 26, 2009) was a professional skier and BASE jumper. He was born in Vancouver, was eventually based in Squaw Valley, California, but because he never identified with a single place due to his itinerant childhood, was “from” Boulder, Colorado, where he started his professional skiing career and attended the University of Colorado Boulder before dropping out of college. He won numerous awards and competitions. McConkey started as a competitive ski racer, but moved on to be featured in a long line of extreme skiing movies. McConkey was known for combining BASE jumping with skiing, as seen in such feats as skiing into a BASE jump off the Eiger. McConkey went to Burke Mountain Academy. He was also known for his contributions to ski design, notably being the father of reverse sidecut and reverse camber skis (aka: skis with rocker); first mounting bindings onto water skis for use in Alaska, then with the Volant Spatula and, more recently, the K2 Pontoon ski design. McConkey’s high-speed chairlift and ski area at Park City Mountain Resort are named after his father, Jim McConkey, who was an early proponent of extreme skiing in the U.S. On April 2, 2011 Shane McConkey was inducted into the U.S. Ski and Snowboard Hall of fame along with other Tahoe skiers, Daron Rahlves and Glen Plake. On March 26, 2009, Shane McConkey died while executing a ski-BASE jump in the Dolomite Mountains in Italy. One of his skis failed to release, sending him into a spin. After he corrected the problem, it was too late to deploy his parachute. Top 3 Antenna BASE JUMPS in Venezuela and Spain. “BASE Tripping” – The incredible new Base Jump Travel series by Carlos Pedro Briceño! “BASE Tripping” is the brand new Base Jump series by Carlos Pedro Briceño. 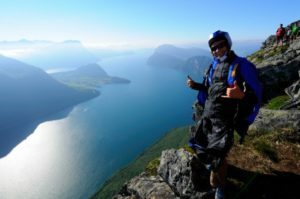 Carlos is a BASE jumper, Skydiving instructor, surfer, travel lover…. & adrenaline lover! Carlos Pedro is a proudly Venezuelan professional Parachutist who is now part of the Elite BASE jump at the World level. Consists of 5000+ skydives, 500+ BASE jumps. Wingsuit terrain flying is his passion. BASE jumping, is an extremely dangerous activity where participants jump from fixed objects and use a parachute to break their fall. "BASE" is an acronym that stands for four categories of fixed objects from which one can jump: Bridges, Antennas, Skyscrapers, and Earth (cliffs). Surreptitious BASE jumps are often made from tall buildings and antenna towers. Many such BASE jumps must be covert because the owners of these objects are generally reluctant to allow their object to be used as a platform. BASE jumpers have generally over 100 regular skydiving jumps done before they attempt a BASE jump, and they usually have an experienced BASE jumper who mentors them on the skills necessary to jump safely. No one should attempt BASE jumping without a lot of training, experience and a good life insurance policy. BASE jumpers have to overcome two major obstacles: low altitude and the proximity of the BASE object. Skydivers open their chutes at around 2,000 feet. This gives them time to deploy the parachutes gradually (reducing line tangles and a sudden jerk on the diver) using a device called a slider. If there is a problem with the main parachute, they can still deploy their back-up chute.